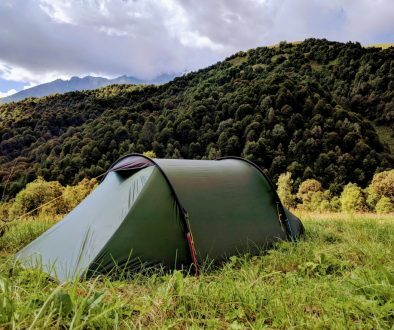 If you’re planning a bike trip to Armenia, you’re almost definitely considering bringing your own bike – and the next question, of course, is how complicated and expensive that’s going to be when international flights and airline baggage policies are involved. Luckily we’ve done all the hard work for you, combing through all of the the airlines that currently fly to Zvartnots International Airport (EVN) in Yerevan, checking out their policies regarding bicycles, and listing them below. Remember that according to European rules, no single piece of checked baggage may weigh more than 32kg. So if you’re stuffing a bike box or bag with accessories and other luggage, make sure it doesn’t exceed this weight limit as no airline flying via Europe will carry it. Aeroflot, the national carrier of Russia, operates multiple daily flights from Moscow to Yerevan and is a popular airline for long-haul travellers coming to Armenia from Europe or the USA, often with the cheapest fares. According to their non-standard baggage rules, a “bicycle correctly prepared for air travel” is “regarded as one piece of baggage” and is “included in the free baggage allowance“. There is no specific information as to how ‘correctly prepared’ should be interpreted, however. Most classes of economy ticket to Yerevan include a single 23kg piece of luggage, i.e. a bike box or bag containing a few additional items. The standard cabin baggage weight limit for economy ticket holders is 10kg. We think most cyclists should fit within Aeroflot’s allowances, assuming the bike bag or box also contains items of luggage up to the 23kg limit. Previously known as AtlasJet, AtlasGlobal is a Turkish airline headquartered in Istanbul, with 4 flights a week to Yerevan between April and October and 1 flight a week at other times. With consistently low fares they are a popular choice for travellers coming from the many European destinations served by the airline. According to the airline’s F.A.Q. entry for excess baggage fees, “The first … bicycle (Bicycle: up to 15KG) are free of charge on all (Including UH Flights) destinations”. Some very heavy duty large-sized touring bikes in cardboard containers may be slightly over 15kg, but most riders should just about be able to fit this limit. Since the free checked baggage allowance works on an ‘unlimited pieces’ concept, this would leave an additional 5kg for EkonomiPlus Promo ticket holders (with a 20kg total allowance), and an additional 15kg for other economy ticket types (with a 30kg total allowance), which could be used for additional pieces of checked baggage, e.g. one or two panniers. The cabin baggage allowance for economy passengers is 8kg, plus one personal item. We think that most cyclists should just be able to squeeze their bicycle and luggage into the free allowances, even for the cheapest tickets, assuming the packed bicycle weighs no more than 15kg. Those with a heavy bike and lots of luggage should be able to achieve the same result on any economy ticket other than the very cheapest. Austrian operate four flights a week from Vienna to Yerevan, and cheap fares can sometimes be found at off-peak times. According to their page on sports baggage, a bicycle will be “carried without a surcharge as long as the baggage allowance shown on your ticket is not exceeded either in terms of the number of items or weight”. The cheapest Economy Light tickets do not include any checked baggage allowance, however, and the 23kg allowance for Economy Classic & Flex tickets is limited to a single piece. An additional complication is tha “we can only transport sports baggage which has been confirmed by us for the registered route before the start of the journey”. Bicycles “must be packed in a protective case or bag (e.g. cardboard or hard plastic)”. If you exceed your free baggage allowance, an extra charge of EUR 80 will apply, and “a supplementary “Excess Baggage Ticket Service Charge” will be levied, the amount depends on the departure airport and varies between EUR 10 and EUR 20″. Carry-on baggage for economy passengers is limited to a single 8kg bag. We think cyclists with any amount of luggage will struggle to fit within Austrian Airlines’ limits, even if your ticket has a checked baggage allowance and you stuff your bike box or bag up to the 23kg limit. Going over the limit will cost between EUR 90–100 extra. The need to confirm bicycle carriage in advance is another negative. Brussels Airlines opened a twice-weekly summer route to Yerevan in 2018, with good value fares in Europe. According to their music and sports equipment page, “[a]ll sports equipment [including bicycles] can be accepted free of charge if they do not exceed the free baggage allowance in number of pieces, weight or size”. If the free allowance is exceeded, a EUR 100 fee applies to bicycle carriage. The cheapest cabin baggage-only fare, ‘Check&Go’, allows you to add a single 23kg checked bag for EUR 25. The cheapest fare including checked baggage – ‘Light&Relax’ – includes a single 23kg piece of luggage. Cabin baggage is generous at 12kg for all economy ticket types. We think most cyclists should fit within Brussels Airlines’ allowances, assuming the bike bag or box also contains items of luggage up to the 23kg limit. Czech Airlines operate two flights a week in the summer season between Prague and Yerevan. According to their baggage page, they will transport “within your free allowance […] A bicycle packed in protective packing not exceeding 23kg in weight [which is] treated as 1 piece of baggage.” While, Economy Plus and Flex tickets both include one piece of free checked baggage, Economy Lite tickets have no checked baggage included. In this case, a 23kg piece (ie. a bike) can be added for EUR 25 if booked at least 36 hours ahead, or EUR 35 otherwise. Regarding packaging, they say that “[t]he bicycle must be partially disassembled for transport with the handle bars in direct axis and the pedals removed”. Cabin baggage allowances are quite meagre at a single 8kg bag for all economy class tickets. We think cyclists with any amount of luggage will struggle to fit within these limits, even if your ticket has a checked baggage allowance and you stuff your bike box or bag up to the 23kg limit. However, since you can add checked bags for EUR 25/35 each as detailed above, additional costs are relatively low. LOT Polish Airlines, the national carrier of Poland, operate two flights a week from Warsaw, with good long-haul connections and reasonable fares. According to their sports equipment page, bicycles “may be carried free of charge if within your Free Baggage Allowance contracted in your ticket. The limitations must be met in regard to the weight per piece and the number of pieces”. For Economy Saver tickets there is no included baggage allowance to Yerevan. For Standard and Flex tickets, the allowance is a single 23kg bag. If you exceed this limit, there is a charge of EUR 60 for international flights (ie: Warsaw to Yerevan) or EUR 105 for intercontinental flights, ie: for long-haul journeys with a stopover in Warsaw. Cabin baggage is a single 8kg bag for economy passengers. We think cyclists with any amount of luggage will struggle to fit within these limits, even if your ticket has a checked baggage allowance and you stuff your bike box or bag up to the 23kg limit, meaning you will likely have to pay an additional fee. Mahan Air is a private Iranian airline offering daily flights between Tehran and Yerevan. Due to U.S. sanctions you won’t find these available to buy online; instead you’ll have to go through your local ticket agent. According to their representative in Yerevan (and in line with our first-hand experiences), Mahan will carry a bicycle free of charge within the generous 30kg baggage allowance included with an economy ticket. The 30kg allowance can be split between multiple pieces, so much of your luggage can also be checked in within this allowance too. We think most riders will easily be able to bring their bike and luggage to Armenia within Mahan’s free baggage allowance. Qatar Airways operates daily flights between Doha and Yerevan, with excellent connections worldwide and relatively low fares for a high standard of service. According to their special baggage items page, they will carry “any sporting equipment as checked baggage as part of the free checked baggage allowance mentioned on your ticket”, including bicycles. For economy ticket holders flying to Yerevan the free allowance is a generous 30kg. There is no limit to the number of pieces, unless you are flying from the U.S. or Canada, in which case you are limited to 2 pieces at up to 23kg each within the 30kg overall limit. Regarding packaging, bicycles must be “properly packed in a strong, custom-made cardboard box. Tyres should be deflated, pedals removed, and handlebars turned and fixed lengthways”. The cabin baggage weight allowance for economy passengers is 7kg. We think that despite the meagre cabin baggage, most riders should easily be able to bring their bike and all their luggage to Armenia within Qatar’s free baggage allowance. Red Wings is a Russian carrier operating flights from Moscow to Yerevan. According to their baggage policy (in Russian), for Standard and IT economy tickets, a bicycle “is regarded as one place and is included in the free baggage allowance“. However, for Light fares it is carried “for an additional fee”. The fee is not precisely specified, but for oversize luggage whose combined dimensions exceed 203cm (ie: a cardboard bike box) the fee is RUB 2,500, or about USD 40, for a piece of luggage up to 23kg. The cabin baggage allowance is just 5kg for most economy fares except Light, which is 10kg. We think most riders with any amount of luggage will struggle to fit these allowances and will have to pay for the bicycle as an additional oversize checked luggage item. UIA operates daily flights between Kiev (Kyiv) and Yerevan, with good connections throughout Europe and consistently low fares. Accoding to their sporting equipment page, bicycles are “considered part of your baggage allowance which together with other pieces of passenger’s baggage should not exceed the established free checked baggage allowance”. For economy fares, the free baggage allowance is a single item up to 23kg. There is a 7kg limit on cabin baggage items for economy ticket holders. We think most riders with any amount of luggage will struggle to fit these allowances and will have to pay for an additional piece of checked baggage. Aegean operate 3 flights a week to Yerevan from their hub in Athens, Greece, making it a popular connecting route for travellers coming from Europe. According to their special baggage policy, “a regular bike (non-motorized touring / racing single-seat bicycle / no e-bike) or a special children’s trolley to use with a bike or a one-wheel bike” will be carried for an extra charge of EUR 50. This is independent of any checked baggage your ticket may include. There is no guidance on how the bicycle should be packaged, however. The checked baggage allowance for Economy Flex ticket holders is 23kg. There is an 8kg weight limit on cabin bags for economy passengers, and 13kg for business class ticket-holders. 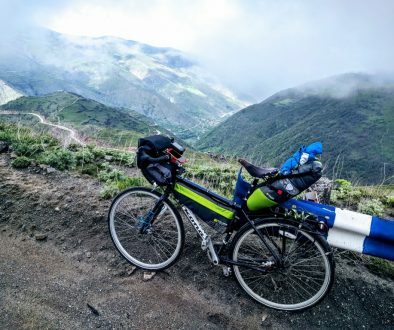 We think riders with several panniers or bags will struggle to fit these allowances, even with the additional charge for a bike, and will also have to upgrade to a Flex ticket to get an additional piece of checked baggage. Air France operate two flights a week from Paris (CDG) to Yerevan – useful if you live in France, perhaps. According to their special baggage page, “Transporting bikes, folding bikes and tandems is not included in your baggage allowance”. Since Armenia is in Zone 3, you must pay an extra fee of EUR 55 for the carriage of a bicycle. Additionally, you “can only transport bikes, folding bikes and tandems in the hold with prior approval from our customer service department”. You must request this “at least 48 hours before your flight’s departure”. As if this wasn’t complicated enough, you must also “Remove the pedals […] Remove the front wheel and attach it to the frame […] Fix the handlebars to the side (parallel to the frame) […] [and] Place your bike, folding bike or tandem in a protective container (cardboard, hard plastic, etc.)”. Generously, bike boxes can be ‘purchased’ at most Air France check-in desks. The cabin baggage allowance, at least, is reasonably generous at 12kg. We think that – especially if a train journey (e.g. Eurostar) is required to get to the airport, which will also require your bike to be packed in an approved container – flying a bike to Armenia with Air France is unappealing. flydubai is a budget carrier operating multiple daily flights from, you guessed it, Dubai to Yerevan, with good connections worldwide. Their website’s baggage and FAQ sections have no specific information regarding bicycles. It is stated, however, that oversized baggage (ie. a bicycle in a box or bag) will be charged per kilo. At AED 25 per kilo between Dubai and Yerevan, this comes to just over USD 100 for a 15kg packaged bike at the time of writing. flydubai tickets don’t include any free checked baggage allowance, so you’ll also need to pay for additional allowance for any luggage you don’t bring on as cabin baggage. However, several cyclists have reported their bicycles being considered an ‘exception’ to the usual size limits and carried as if they were regular checked bags. We think you’ll be best off checking with your local flydubai sales agent and getting a statement on the bicycle carriage in writing before trying your luck at the airport. Germania Airlines began regular flights from Berlin to Yerevan in 2018. According to their special baggage page, a fee of EUR 60 per one-way journey applies to bicycles, with a maximum weight of 30kg. This is independent of the checked baggage allowance included with your ticket, which for flights to Armenia is a generous 25kg regardless of fare. Regarding packaging, bicycles should be “preferably packed in a box or suitcase”. We think that all cyclists should easily be able to bring their bikes plus any realistic amount of luggage for the simple flat fee each way, given the generous baggage allowance included with all tickets, making Germania one of the best of the fee-paying airlines for cyclists coming to Armenia. 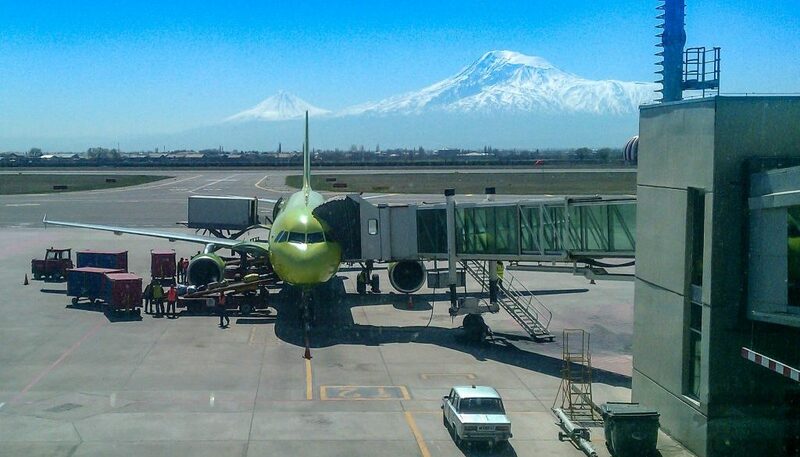 S7 Airlines is a Russian carrier operating direct flights between Moscow and Yerevan as part of the oneworld alliance. 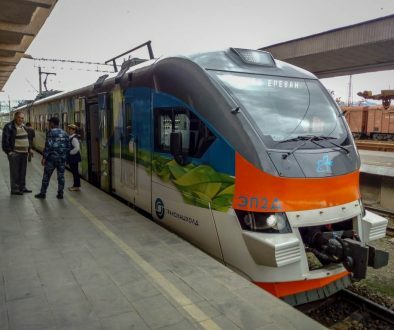 There is no specific guidance regarding the carriage of bicycles, but according to the baggage section of the FAQ, a standard sized bicycle box would be classified as ‘outsize baggage’ and thus be subject to an additional fee of EUR 35 between Moscow and Yerevan, with a weight limit of 23kg. We assume additional fees would apply for other legs of a longer journey. A 10kg limit applies to cabin baggage for economy ticket holders. We think most riders with bikes and luggage should fit S7’s allowances with an additional charge for an oversize item; however the combined fees for a long-haul return trip could be very costly. Share this with your riding buddies! Text and images © CyclingArmenia.com and contributors. All rights reserved. Third-party content may be subject to other licenses.